This healthy, low fat Anthotyro-cream cheese strawberry Jelly is made with real strawberries and anthotyro, a low fat cheese, similar to ricotta. After Easter I’ve started watching my weight again and have been going to the gym everyday. A few days ago when we went to the supermarket I found myself putting some low fat products in the cart. I bought some Dirollo cream cheese with 3% fat, myzithra which is similar to ricotta, again a low fat cheese, fructose, mostly to be used for breakfast. I am not following any particular diet but mostly eating grilled chicken, turkey burgers, fish, “ladera” with minimum amount of oil, once a week and even pasta, salads and fruit. I was not planning to make dessert but being used to cook everyday I had the urge to create something and kept thinking what I could make which would not be too sinful. If I had thought of this earlier I would have bought some low fat digestive biscuits and make a cheesecake but since I did not want to line up in the supermarket again I decided to use what I had bought. I decided to use the fructose, although I’ve never used it before. From what I read on the package 100 grams fructose has 400 calories and is 70% sweeter than normal sugar. I didn’t know how much to use so I just tasted it in the end and adjusted the amount. The amount of fructose to add will also depend on how sweet the strawberries are. Update: This recipe was made before stevia was known in Greece. If I made it again I would substitute fructose with stevia. I don’t mind if desserts are not very sweet but if you like your desserts very sweet this dessert is not for you. If you add more fructose to make it sweeter then you might just as well use ordinary sugar. My children are not on diet so they added some ice cream and a rose cordial syrup to sweeten it up a little. If you are dieting, it’s pretty much a guarantee that you will have a craving for a dessert that tastes great and is low in calories. I can still remember the period before creating the blog that whenever I went to a dietician, the only dessert in the menu was jelly. I now feel so stupid buying the low calorie jelly from the supermarket which is full of artificial colour, artificial flavour and has nothing to offer. I am not a dietician but as you can see, each piece has only 189 calaries. So when you get indulgent, this is a great dessert, taking into consideration that all the products used are natural. Stawberries are not only very flavourful but they are also packed with vitamin C and antioxidants. Not only are dairy foods like milk, cheese, and yogurt excellent sources of protein, but they also contain valuable calcium, as well as some vitamin A, B12, riboflavin, zinc and phosphorus. Choose skim or low-fat dairy to keep bones and teeth strong and help prevent osteoporosis. Honey is also a source of antioxidants and many other valuable properties. Put the gelatin leaves in a bowl with water and set aside for fifteen minutes until they become soft. Meantime measure the water which you will use later on. Wash strawberries and remove the stems. Cut into small pieces in a non stick frying pan. Add ½ cup of the measured water as well as fructose and mix well on medium heat until the strawberries begin to boil. Mean time in a small saucepan heat the remaining water and dissolve the gelatin (without the water added to soften the leaves). Pour in the strawberries, mix for ten minutes and set aside to cool for about ten minutes. In a food processor add most (about 2/3) of the strawberries with some of the liquid and puree. Return back to the remaining strawberries and set aside until it cools. (Do not refrigerate as it will set). In a small saucepan, mix gelatin with milk and let it stand until softened, about 5 minutes. Place over low heat, stirring constantly until gelatin is dissolved, about 1 minute. Remove from heat and cool slightly. Beat myzithra and cream cheese with honey and rose water until smooth. Add gelatin mixture and thoroughly blend into cheese mixture. Put into a rectangular bowl 23 X 28 cm (9 x 11 inch) and refrigerate for about 2 hours until it sets. Add the strawberry jelly on top, a spoonful at a time as we must be very careful not to crack the cheese mixture. Refrigerate overnight. This recipe was made before stevia was known in Greece. If I made it again I would substitute fructose with stevia. Previous Post: « Mount Hymettus, a paradise so close to Athens. That dessert looks so fresh and delicious! A great low fat recipe! A light, and delicious summer dessert! Glad to see you again Valerie. I shall correct my reader with your new URL. Sounds like a healthy and delicious treat! looks so good and perfect for a diet! Un dessert qui me convient. Wow catchy and delicious jelly, looks truly yummy.. I really like this combo – I eat cream cheese and strawberry jam on toast. It's such a great flavor combo. That's why I love your dessert! I haven't seen any kind of fructose here in the market. I will have to look further – would love to use that to replace some of the sugar I eat. Such a healthy yet lovely combo, wow! 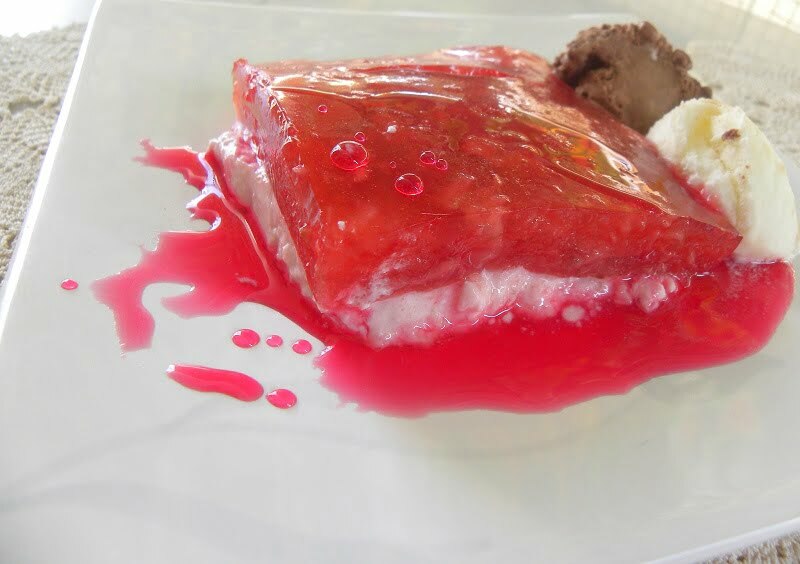 Mmmmm, I could become cheese addict after seeing your dessert :D. It looks delicious with the strawberry jelly. Great creation Ivy! much prefer that to the traditional American cheesecake that is so dense and heavy and sweet! This looks so appetizing Ivy! O wow strawberries and rose water, i can already taste it Mmmm! I don,t like these sweet jelly foods. I am going to try it now.Thanks for the easy, healthy recipe.